Completely transform your space by hanging a Napoleon Allure 72-inch Electric Fireplace. The Allure 72-inch is a work of art, easily hang it on the wall and plug it in to create instant luxury. The sparkling glass ember bed reflects the beautiful flames; flames that can be refreshing blue, sunny orange, or something in between. Control mood and temperature easily with the included remote control. Protruding only 5 inch off the wall when hung, or fully recessed, the Allure 72 Electric Fireplace only adds to your space. Ideal for anywhere a gas fireplace can't go, an Allure Electric Fireplace easily adds shine and luxury to your space. With a bold modern design, this typically traditional furniture piece receives a refreshing facelift into the age of clean lines and sharp contrasts. The Anthony Mantel displays a 28 inch Dimplex Electric Fireplace, which appears to extend past its impressive flame effect with the help of the stark black surround. With features across multiple designs and a Natural Walnut finish, the Anthony Mantel can easily complement modern and transitional spaces. Looking to add an eye-catching furniture piece to your living space or study? Look no further than the handsome Anthony Electric Fireplace. This unique and charming electric stove adds warmth and pizzazz to any room. The clean, modern lines are highlighted by the gloss red finish and louvered front panel. Realistic flames rise up from a glowing coal bed providing cozy year-round ambiance. The Hampton Bay 20 inch Matte Black Electric Infrared Stove is ideal for homes, condominiums, lofts, apartments and seasonal rooms. The patented panoramic design provides a unique 3-sided view of the flame and ember bed through the operable glass doors. This unit has a 2-stage fan forced air heater that allows for a high or low use setting. It provides 4,600 BTUs to heat a room up to 1,000 sq. ft. Simply assemble the legs onto the base and plug it in for instant heat or use it without the heater for year-round enjoyment. Allure 72-inch Linear Wall Mount Electric Fireplace Completely transform your space by hanging a Napoleon Allure 72-inch Electric Fireplace. The Allure 72-inch is a work of art, easily hang it on the wall and plug it in to create instant luxury. The sparkling glass ember bed reflects the beautiful flames; flames that can be refreshing blue, sunny orange, or something in between. Control mood and temperature easily with the included remote control. Protruding only 5 inch off the wall when hung, or fully recessed, the Allure 72 Electric Fireplace only adds to your space. Ideal for anywhere a gas fireplace can't go, an Allure Electric Fireplace easily adds shine and luxury to your space. 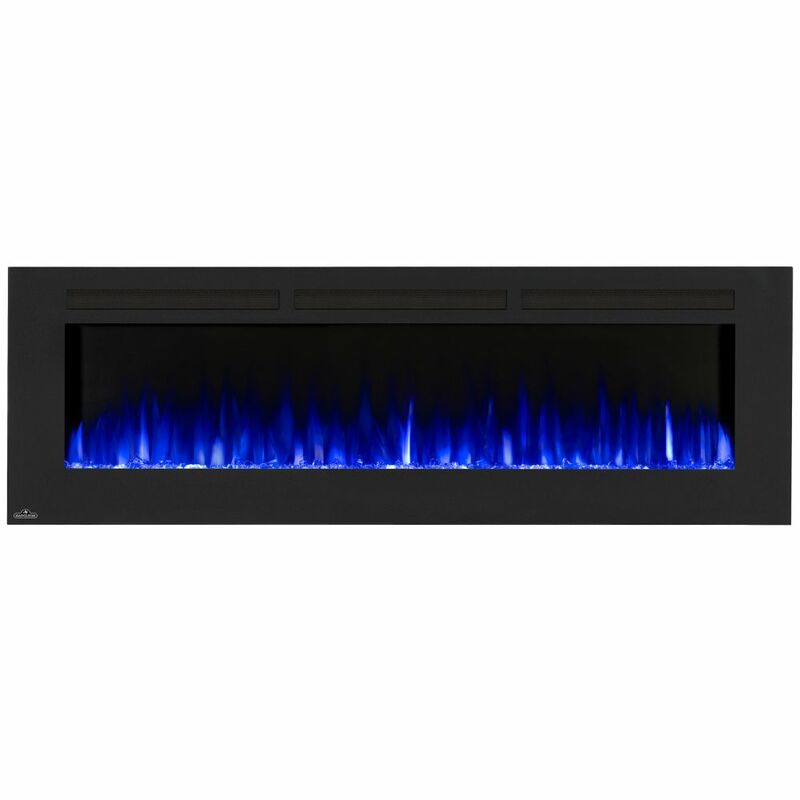 Allure 72-inch Linear Wall Mount Electric Fireplace is rated 4.8 out of 5 by 4. Rated 5 out of 5 by HomeDepotCustomer from Looks fabulous. We hardwired for 220 to getter more heat... Looks fabulous. We hardwired for 220 to getter more heat efficiency. Rated 5 out of 5 by Sporty from Yes.,, easy to assemble and it looks great.... Yes.,, easy to assemble and it looks great. Rated 5 out of 5 by Dawnp from Beautiful, love it. I moved to a condo from a larger home and still wanted to have the look of a... Beautiful, love it. I moved to a condo from a larger home and still wanted to have the look of a fire. The directions were a little confusing and I recommend recessed mount. However I had a brick wall to mount to and it looks great and it warms my room quite well. My husband loves all the settings and the remote control with the timer. We are thrilled.